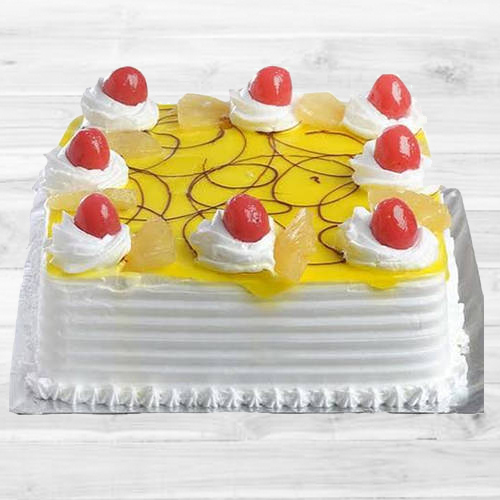 Give an colorful touch to every celebration by gifting this Silky 1 Kg Eggless Pineapple Cake. Dessert lover s delight, this Marvelous 1 Kg Eggless Vanilla Cake will satisfy every taste bud. Put a big-smile on your loved ones by delivering this Bakery-Fresh 2.2 Lbs Eggless Strawberry Cake. Send a bag full of happiness along with this Delicate 1 Kg Eggless Black Forest Cake to your beloved person. Order online for your loved ones this gift of Premium 12 Red Roses with 1 Kg Eggless Pineapple Cake that conveys how much you love them even if you remain silent. This Delectable 2.2 Lbs Eggless Plum Cake from Taj / 5 Star Bakery is just that appropriate cake to celebrate any event.